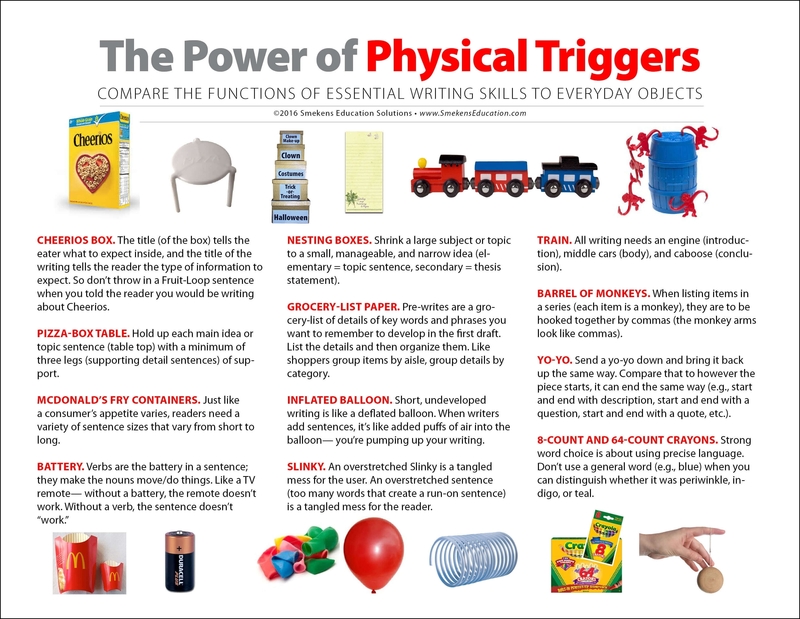 Physical objects can make your 6-Traits writing lessons more powerful. Not only do they ramp up the level of student engagement, but they also help students remember the purpose and function of specific writing skills. Here are some favorite Smekens Education triggers and the writing skills they support. TRAIN CARS: Use three train cars to represent the introduction, body, and conclusion. Whenever students write, they need a beginning (train engine), a body (middle train cars), and an ending (a caboose). MCDONALD'S FRY CONTAINERS: Stop by your local McDonald's and ask for three French fry containers that represent each size they offer. Then use these containers to illustrate the importance of sentence-length variety. Sometimes we have an appetite for a "snack-size" order for fries. In the same way, there are times when it's appropriate to write short, "snack-size" sentences. Conversely, when there's more information to chew on, it's more appropriate to "supersize" writing with longer, more complex sentences. Just as you wouldn't always want to eat the same size of fries, you also wouldn't want to provide readers with one-size-only sentences. GROCERY LISTS: When pre-writing, writers simply jot a list of key words and phrases on a topic; they don't write whole sentences. Compare this step in the writing process to generating a grocery list of details to remind the writer what to include in the first draft. When identifying a mini-lesson trigger, first consider the function of the writing skill. The key is to really understand the purpose the skill serves within writing. With that knowledge, then think about what object in the real world works like that. For example, when teaching students to narrow their topics, the goal is to show them how to go from a large, broad subject to something smaller, more finite. It's all about shrinking the topic. Everyday items that get smaller are Russian stacking dolls, Tupperware, and nesting boxes. 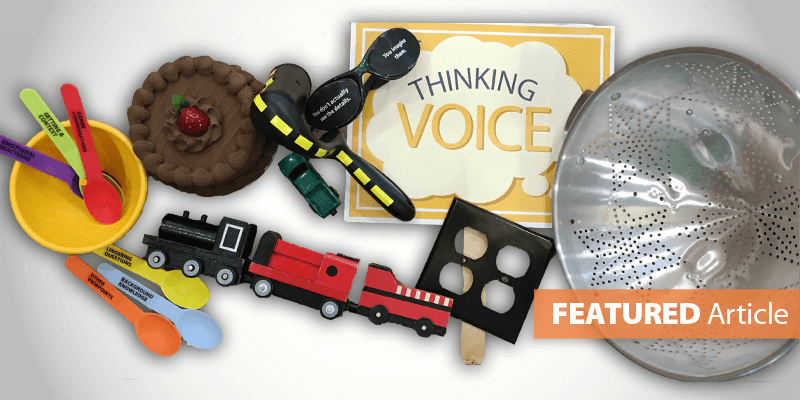 Using one of those objects as part of the lesson helps students to visualize the idea of starting with something big and moving to something much smaller, much more focused. Here's a second example of identifying a physical trigger. When planning a lesson on avoiding run-ons, think first about the effect of such a sentence. It's too many words. It's too long. The reader gets confused. It's like a tangled mess of words. Now consider what real-world object gets tangled when it's stretched or pulled too long--a Slinky. If you overstretch a Slinky, it becomes a tangled mess. That's exactly what run-on sentences do to readers; they tangle them in a mess of details. 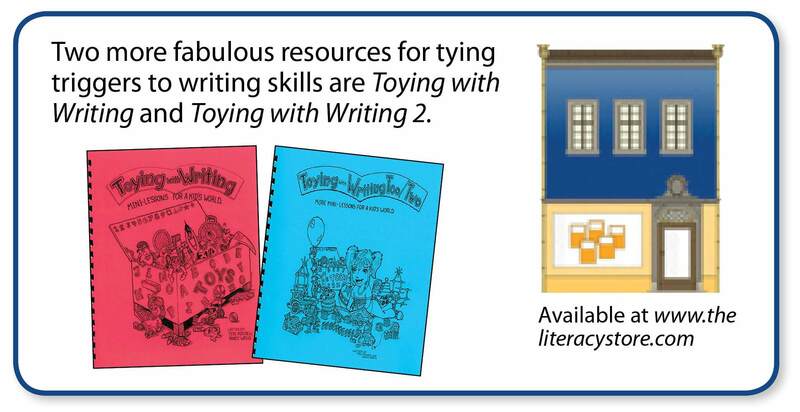 For more trigger suggestions for common writing skills, check out this digital download. 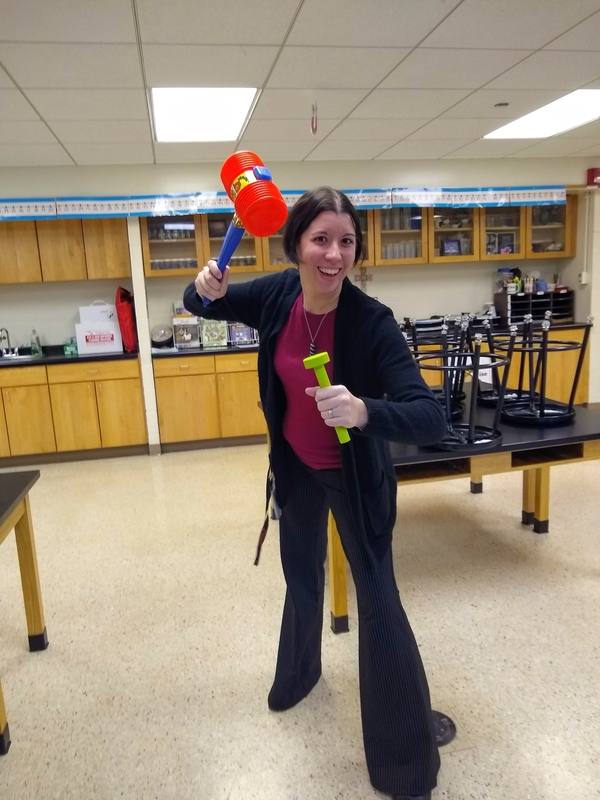 Amanda Studer, middle school teacher at St. Raphael Catholic School (Naperville, IL), shared how she is incorporating visual triggers into her grammar lessons. She used a squeaky hammer to represent the subject in a sentence and a jumbo nail to represent the direct object. Her students loved it! Her next lesson plan includes teaching predicate nominatives and predicate adjectives with junky old paint-covered paintbrushes. What a great connection between concept and trigger! As an instructional coach, I am able to go into classrooms from first to fifth grade to model writing lessons. Slinky sentences are one of my favorites also. I was in a second grade classroom last week, about four weeks after introducing that particular group to Slinky sentences. We were working on making final changes to the letters they were writing. As I was conferencing with one boy, I turned to scan the room and noticed that literally over half the class had their "Slinky hands" up and were measuring their sentences. I loved it! Using toys as a means of teaching writing is certainly powerful. In a different class, I was conferencing with small groups. Because I only had four kids at my table at one time, I used those snap-together math manipulatives to do the "Tower Test," one block for each word in a sentence, one tower for each sentence in the paragraph. The kids were amazed at how many four and five word sentences they used. That alone encouraged shorter and longer, more detailed sentences. In addition, in younger classes, the terms, "Sentence Fluency" and "Conventions" are sometimes hard for them to remember. But, as soon as I show the Toobaloo, they immediately remember that, "Every time I write, I have to read it out loud to myself." Likewise, when they see my toolbox, they may not remember the word "conventions," but they do remember that it means "Anything I can fix." 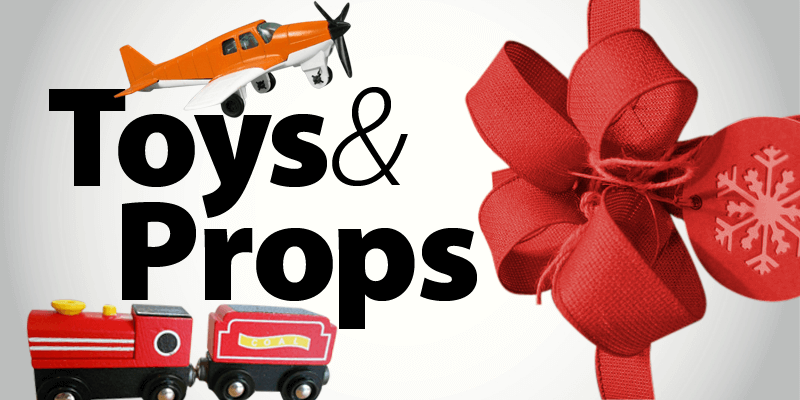 I will never teach without toys again!